Design Inquiries: is it pinstripe wallpaper or painted? Something masculine & rustic with a bit of glam…. Two different finishes of paint were used to get the look above. You can apply the same technique to a thinner stripe. I blogged about it once before in my subtle stripes posts. 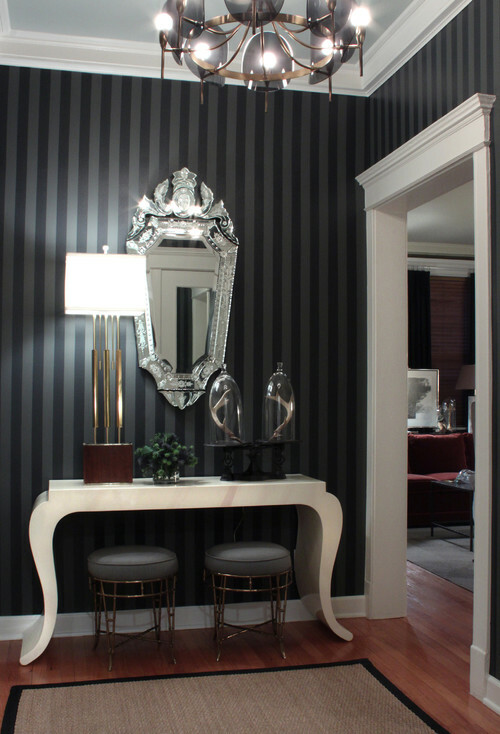 In the hallway above is a black, silver and gold pinstripe wallpaper from Graham & Brown..
Birdhouse Interiors simply painted the grooves to update the look of the wood paneling. If you have a question, shoot me an email and it may just appear on Design Inquiries.